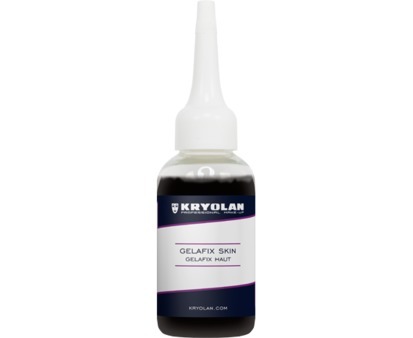 Gelafix Skin is a material that is friendly to the skin and easy to apply. It is designed for creation of skin anomalies, especially for the simulation of severe burn injuries. 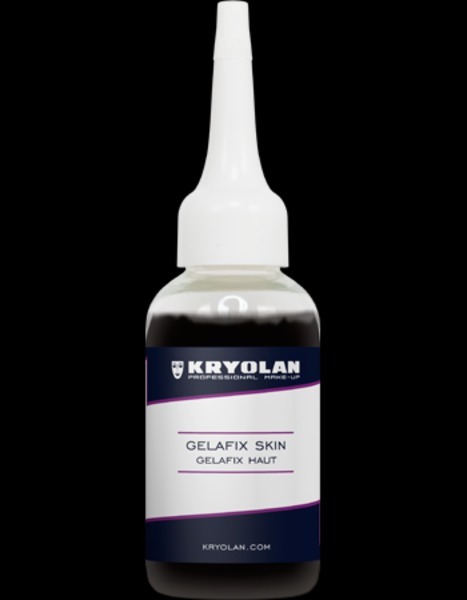 Gelafix Skin is breathable and is especially comfortable for the actor to wear. Gelafix Skin is also used in fashion and avant-garde make-up for the presentation of creative skin applications, such as artificial tears or 3D ornaments. Gelafix Skin is first heated in the supplied bottle in a water bath or just very short-time in a microwave until the material has melted. Pour the contents onto a plate or blending plate. Check the temperature of the material and then apply it quickly to the skin with a spatula. After drying, apply a light coat of Translucent Powder and then use Supracolor to provide the required colour design, finally set with Translucent Powder. The moist effect of a fresh burn wound can be simulated by using Transparent Jelly. To remove, peel off the skin or use plenty of warm water.